Palliative care is a medical specialty and philosophy of care that focuses on reducing suffering among patients with serious illness and their family members, regardless of disease diagnosis or prognosis. As critical illness is often life-threatening and confers significant disease-related symptom burdens, palliative care and palliative care specialists can aid in identifying goals of care, reducing symptom burden, and improving quality of life among intensive care unit (ICU) patients and their family members. Palliative care in the ICU can be delivered by the ICU team itself, specialist-trained palliative care consultants, or a combination of both. Though initial reports describing end-of-life care practices in the ICU were published in 1976, the modern era of palliative care research in the ICU began in the early 2000s. Since 2010, the Improving Palliative Care in the ICU (IPAL-ICU) Advisory Board has published a series of articles exploring opportunities and barriers to palliative care delivery in the ICU, particularly across different ICU types, ICU providers, and ICU patient populations. Furthermore, initiatives to improve delivery of “family-centered care” in the ICU frequently also correlate with palliative care practices. 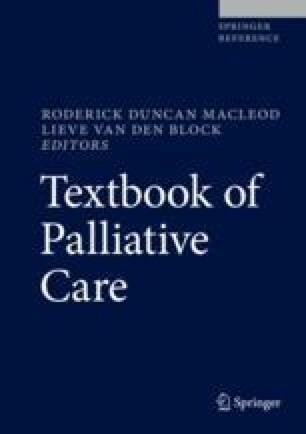 To date, over 40 palliative care and palliative care-related interventions targeting ICU patients and families have been trialed and published with results showing mixed effectiveness on outcomes such as ICU length of stay, patient and family symptoms, and family member satisfaction; several randomized trials provide important insights into interventions that improve patient and family outcomes as well as those that do not. Accreditation Council for Graduate Medical Education. Program requirements for graduate medical education in hospice and palliative medicine. 2018. Available from http://www.acgme.org/Portals/0/PFAssets/ProgramRequirements/540_hospice_and_palliative_medicine_2017-07-01.pdf?ver=2017-05-03-135824-423. Accessed 15 April 2018. World Health Organization. 2018. WHO definition of palliative care. Available from: http://www.who.int/cancer/palliative/definition/en/. Accessed 15 April 2018.